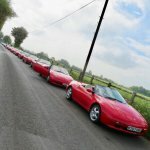 The day has came, and i can now call myself an Elan owner. Picked it up last night and enjoyed the wee 3/4 hour drive home! I luckily managed to get it off another LEC member, who gave me plenty of invaluable advice. What was the chances of me seeing it on the wee journey back eh , looked brilliant as it flew past, made me realise how different the Elan looks to everything else on the roads these days, such a unique shape. Glad you got one at last mate, looks great . Congratulations and enjoy your ride! That's not your one though is it Andy ? Thought you had an H plater ?? Rambo wrote: That's not your one though is it Andy ? Thought you had an H plater ?? Still got the H - plate one, It is the K-plate one I bought form another LEC member 2 years ago, Lorna had it over at Archie's last year when we went up to Aford with Club Lotus NES. ah so one of your flock Andy. Morcii, Bo'ness 2nd wed every month so next is May 13th. GeoffSmith wrote: Rambo's avatar. Lovely.